Dyne QuickTest Pens allow you to measure the surface energy of your material. One quick test will identify if the surface is treated to a level of 38mN/m (Dynes/cm) or higher, quickly identifying the treated or non treated side of the material especially useful on polyethylene or polypropylene films after corona surface treatment. Easy to use, Dyne surface energy Quicktest pens (sometimes known as corona pens, sherman pens or printers test pens) are ideal for use in print shops, giving a rapid indication of the surface energy of the material to be printed. 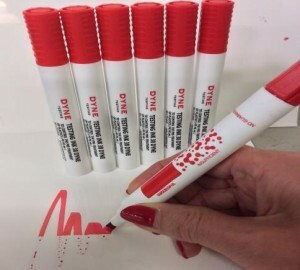 Simply draw the Dyne QuickTest Pen tip across the surface to be tested. If the ink line shrinks or beads within 1-2 seconds then the surface does not have a surface energy of 38 Dynes/cm (mN/m) or has not been treated to the level 38 Dynes. If the Dyne quick test pen line remains as marked and does not shrink then the surface IS treated to a level of 38 Dynes/cm (mN/m) or higher. Please advise the quantity you require when you send your enquiry through. Only available as 38 Dynes/cm (mN/m).